The major social networks are all in redesign mode. Facebook is rolling out “Timelines,” a more picturesque version of user Profiles. Twitter has completed a major redesign, which I covered last week in “Understanding Twitter’s New Redesign.” And now YouTube is changing its appearance and navigation, presumably to make the site more useful for both users and video creators. One of the issues faced by both groups is that the huge amount of video content on the site made navigating through it a challenge. The design is now simplified, focused on helping users “discover a broader range of entertainment,” says YouTube. “We’ve given YouTube a refresh. When you login, you’ll be greeted with recent activity from your subscriptions. You can also browse and add new Channels to your homepage. Connect with Google+ and Facebook to share your favorites with friends,” states the site. This article outlines the new features, emphasizing how merchants can use them to increase YouTube’s effectiveness as a marketing channel. The changes cover three main YouTube areas: home page, Channels, and overall site design. The home page has undergone a complete redesign. On the left-hand side users can create their own, personalized YouTube Channel line-up. They can also browse recommended channels, customize their home page feed, and link to social networks like Facebook and Google+. Discussing changes to Channels is what I’ll stress for this article — in the section below. Google opted for a cleaner, simpler design complemented by a gray background, larger video thumbnails and a more streamlined watch page. If you are a registered YouTube user, you can have a Channel. Think of it as YouTube’s version of a Facebook Page. YouTube has drastically simplified the look and feel to not only make the job of uploading and featuring videos much easier, but to provide a better experience to subscribers. Even if you already have a Channel, it’s worth your while to visit the site to ensure you take advantage of what the redesign has to offer. Once you have logged in, click the “Edit Channel” button, which is located on the right-hand side of the header area on your Channel page. This governs the overall look of the Channel, as well as the information presented on it. Start by clicking the Edit Channel button. This is where you change or upload an avatar and set the Channel background image and colors. I recommend taking this step to improve branding. The best way is by uploading a custom graphic with your logo, website color scheme and other pertinent information as needed. Consider using your logo as the avatar. Use the “Default Tab” drop-down menu to choose the tab people see first: Featured, Videos, or Feed. Another option — a check box — allows subscribed users to always land on the Feed tab first so they see the latest content. YouTube offers four Channel layout templates. Creator. This includes a featured video from a playlist with a group of featured playlists underneath it. Blogger. This template mimics the look of a blog with videos listed in reverse chronological order. Network. This includes a featured video from a playlist with a group of featured channels and is only used when merchants have multiple YouTube channels. Everything. This includes a featured video along with both playlists and channels. Once a template has been chosen, select a video to feature. Follow these two steps to add a featured video. Step one: From the Channel home page, click the “Add a featured video” button. Select a featured video by clicking the Add Featured video button. Step two: When clicked, the “Add a featured video” button changes to a dialog box that allows you to choose a video from a drop down list. Once you’ve selected one, click the “Apply” button. Featured video dialog box appears once Add Featured video button is clicked. Select a featured video from the drop down list. “Channel Feed” is where the action takes place. 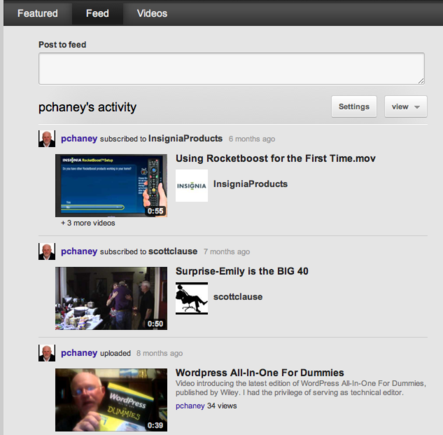 Users can click on the Feed to see what’s new and allows Channel administrators to showcase the latest activity. This feature is YouTube’s version of a Facebook status update or a Twitter tweet. The Channel Feed is where subscribers can view the latest activity. YouTube describes the Feed as your Channel’s “distribution center.” Any content shared here — uploads, comments, favorites, likes, playlists — will be posted to your feed and seen by your subscribers on their individual Channel home pages. I recommend posting items to your feed regularly. This keeps your Channel content fresh, maintaining more top-of-mind awareness with subscribers. In the past, uploading and organizing videos has been arduous. I always had difficulty locating the “Upload” button, for example. The new Video Manager is a self-contained dashboard that simplifies this process. 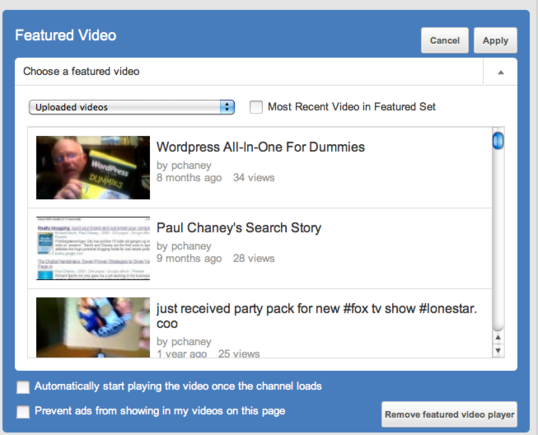 The new Video Manager is a self-contained dashboard for uploading and organizing videos. Click “Upload” to start uploading a video. The arrow on the right side of the button provides upload options, such as recording video directly from a web cam. Click the Upload button to start uploading videos. Tabs on the left-hand side of the page allow you to access Uploads, Playlists, History, Favorites, and Likes. 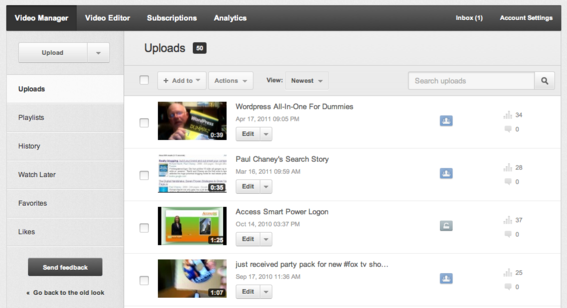 The thumbnail of videos will contain different information about your video, like its uploading and processing status. 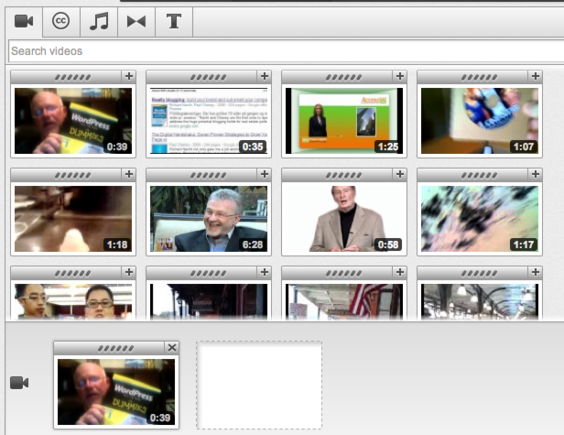 A list of icons located to the right of video thumbnails indicate different information — such as view count and upload progress — about the videos. The Video Editor allows you to preview videos before selecting them for editing by clicking on the center of the video thumbnail image. To edit a selected video, click the “+” sign located on the left. After clicking the plus sign, the video will appear in “Storyboard.” Videos can also be dragged and dropped into the area. Video editing is made easier through the use of the new Video Editor dashboard. This section shows you channels to which you have subscribed and makes recommendations for others to consider. For merchants, this could come as both as a blessing and a curse. It means that, though current subscribers are much more likely to see your content than in the past, the burden is on retailers to grow their subscriber count. But, with more subscribers comes increased numbers of video views and impressions. YouTube has also improved its analytics dashboard to focus on five areas: “Performance” (views and subscribers), “Engagement” (likes, dislikes, comments, shares,), “Top 10” viewed videos, “Demographics” (location, gender), and “Discover” (top traffic sources, and top playback locations such as YouTube, mobile devices or other channels). By simplifying layouts and housing video uploads and editing into administrative dashboard arrangements, YouTube makes the site easier to use. Plus, the added emphasis on subscriptions means that merchants stand a better chance of gaining top-of-mind awareness with customers and prospects.